The institute of Business Management is a private university and business school in Karachi, Pakistan. Since the beginning of its journey, IOBM’s Social Welfare and Trust Society (SWAT), has been tirelessly endeavoring, for the prime goal of helping and serving humanity and general welfare of people, by rendering services to the afflicted and the less fortunate and this would not have been possible without our faculty advisor Sir Maqbool Ur Rehman’s constant support and assistance who has helped us prosper in our cause. Like a well-oiled machine, SWAT runs upon certain fundamental principles that distinguishes it from the rest of the societies, most important of those principles being; utmost dedication, hard work and relentless commitment. We strive each day to work for what the society stands truly for; to serve humanity and inspire change to improve lives. SWAT is not just a society that helps the ones who have succumbed to hard ships; we are an entire framework, a family that has united under one umbrella to become the advocates of the fallen and deprived. Since SWAT works primarily for the welfare and constructive rehabilitation of the society, we are always evolving and initiating more campaigns and drive to benefit as many people as we can. Since its inception SWAT has been engaged in various projects ranging from distribution of clothes, to food items, medical supplies, basic human necessities, education for underprivileged children, families, cleanliness drives, sports day events. The SWAT School Department launched Educate a Child Program through IoBM which is an important feature of the Department through which the education of our SWAT students is funded via sponsors. child which includes uniforms, books, bags, shoes etc can be catered to and so that more money could be raised for the functioning and sustainability of School Department. The profit generated from this program will be deposited in the Endowment Fund. Sponsors under this program will be responsible for the education of a child. They will be given continuous feedback and progress report about the assigned student they are sponsoring. SWAT held its very first meat drive during the Eid Ul Adha of 2011, where a great amount of meat was collected and distributed among the poor and needy in remote areas like Katti Pahari, Pahari gunj, Ibrahim Hyderi among others. Since then the welfare society holds this drive every year with an increasing amount of meat collected and then distributed in forms of 1 kg packs. SWAT officially conducted it’s project during the three days of EID which is from the 13 th to 15 th of September. 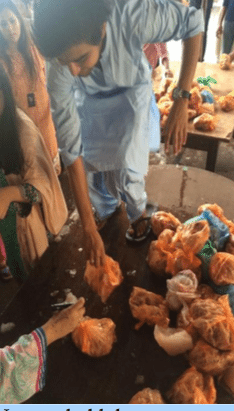 The first two days are usually dedicated to collecting packaging and storing meat, and the 3 rd day is set for our big meat distribution in various underprivileged areas of Karachi but this year we even distributed meat on the 2 nd Day of Eid in Landhi area. New and old donors were contacted to ensure maximum possible collection of meat from different areas of Karachi ranging from DHA to North Nazimabad. The storage, security, marking and distribution teams worked tirelessly to distribute 4500 kg of meat in the areas of Landhi, Ibrahim Hyder and Orangi town under the supervision of Sir Maqbool Ur Rehman. After a successful Pink Ribbon Drive in 2015, HEC collaborated with SWAT yet again for Pink Ribbon Youth Awareness Drive 2016. The main objective of this collaboration was to create awareness among young people in universities and colleges, to know of the very common cancer that majorly affects women, both young and old. Around 40,000 women die each year because of Breast Cancer, why? Because they are not aware about the deadly cancer they have. Iobm’s Social Welfare and Trust took a step together to fight against it and help young women and men to be aware about it. If they are aware, they will help in fighting against it. Student Activity Centre in IoBM on 23 rd October, 2016. This desk was set up for the purpose of collecting donations for the hospital and to tell the young females in the university of the threat they are exposed to. The young and enthusiastic individuals of the society approached females currently studying in the university, discussed with them the symptoms of the disease, and what they should do in order to avoid it. Our creative members came up with the idea of setting up a candy floss stall for the students, proceedings from which were used to add to the donations. The candy floss was a hit among the students, and considerable funds were raised from it. All the money was donated to the new Breast Cancer Hospital. The greatest achievement of all was, Swat helped hundreds of young men and women in being aware about this deadly cause. Swat promises to stand for this cause and will support this campaign to help in building this hospital to ensure that none of us will have to bear the horror of losing a mother, a sister, a wife or a daughter. Together we stand, together we rise. SWAT in collaboration with the Indus Hospital conducts a Blood Donation Drive every year. Indus Blood Bank is a well-known blood bank all around the world with International protocol and we are glad to be a part of the annual drive with such a reputable and genuine organization. 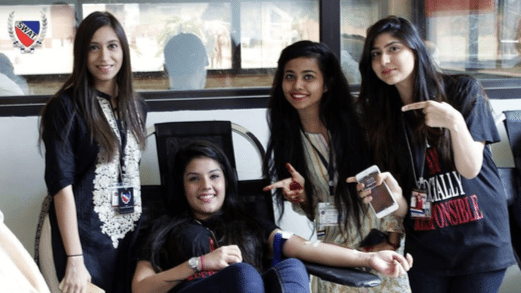 The basic aim of the blood drives are to collect as much blood donations as possible within the confines of the IOBM campus for which a two day blood camp is set up in the activity lounge of the campus. The blood collected is used for the treatment of patients suffering from blood disorders such as Thalassemia. 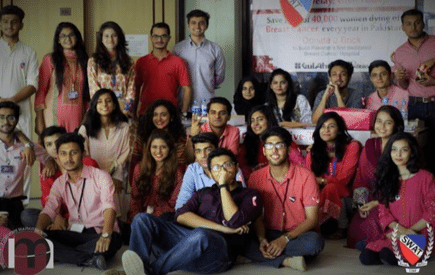 Therefore, continuing its passion for making our society a better place for all SWAT conducted its very first Blood Drive this year on the 10th of February dedicated to raise awareness about the deadly ailment of breast cancer.Drive was also promoted extensively throughout the campus and also widely on social media platforms such as Facebook, Instagram and Snapchat. throughout the process. This year SWAT was able to gather as many as 174 pints of blood which surpassed our previous record 118 by a huge difference. This monumental amount of blood collected will help in saving more than 500 lives of those suffering from severe life threatening diseases. assistance to as many underprivileged people as possible who are either living under unsatisfactory conditions or are on the streets during fast. Swat conducted its very first “Act Of Kindness” Project during Ramadan this year(2016). The purpose of the project being an extension to the previously conducted “Annual Ramadan Drive” is to reinforce and highlight the importance of serving the poor in the holy month of Ramadan and celebrate it with the underprivileged children, women and men. In the Act of Kindness campaign, SWAT as a whole took the responsibility of spreading smiles amongst the less fortunate. This campaign included various activities like visiting an old age home, celebrating chandraat with the children, a day with orphans, distribution of iftar boxes and ration bags, building of a well etc.